Console your reflection with a soft sprigged muslin gown - a veritable Feminine Fancy! The "Feminine Fancies" collection direct from Paris should answer all your early 19th century needs. In a delicious range of pastel-coloured sprigged muslin, complete with complimentary sashes and ribbon trimming, your Regency ladies need never be without a pleasant morning gown to frolic about in! Suitable for a variety of situations - daring proposals, exciting elopements, solitary walks and girlish antics will now look suitably charming with some sprigged muslin gowns in your neighbourhood. Enchant a haughty gentleman of property - or perchance a brooding stable-boy? - today in the "Feminine Fancy"! 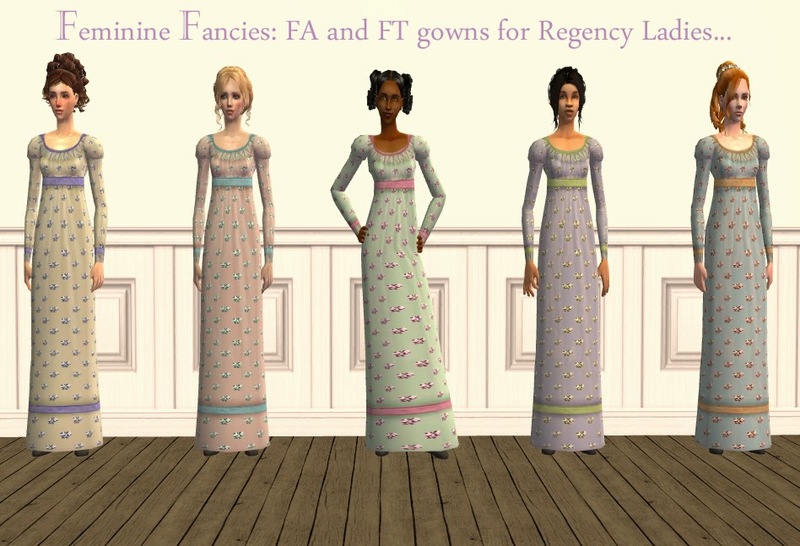 Note: the "Feminine Fancies" collection accepts no responsibility for any lack of haughty gentlemen of property, rash marriages with unprincipled rakes, or vampiric ghouls you may encounter whilst wearing the "Feminine Fancies' gowns. To be used entirely at your own risk. 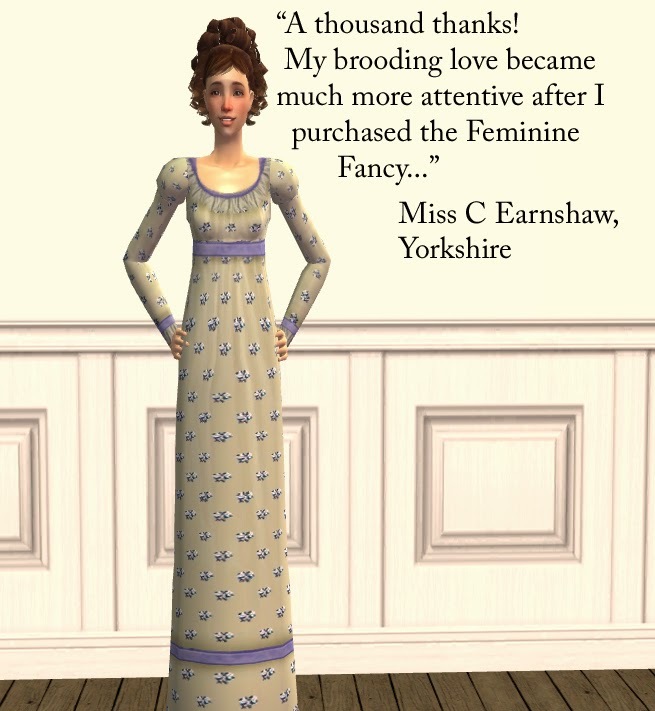 Many thanks to the amazing IamLiz13 over at ModTheSims, whose wonderful meshes for regency gowns are made of awesome. I wouldn't be able to do a thing without talented people who can mesh making this sort of stuff! Thanks are also to the great All About Style, whose great Sims 2 downloads were probably the first thing I ever grabbed for my game! You can find more of her amazing stuff here : http://www.all-about-style.com As per their generous TOU policies, I've included the meshes with the recolours. All textures are frankensteined between my own stuff and some Maxis textures. I filed both sets separately, in case you'd prefer to have this set for teens without adults in pale florals, or the other way around. Very cool, just what my ladies need for the long winters, thanks.